One of the "few regrets" of his presidency, President Obama said dolefully in his State of the Union speech, was "that the rancor and suspicion between the parties has gotten worse instead of better." Were he endowed with "the gifts of Lincoln or Roosevelt," he remarked, he could have done more to bridge the partisan divide. But he pledged to "keep trying to be better so long as I hold this office." Did you experience a touch of d�j� vu when the president said that? Four years ago, when he was in the home stretch of his first term and running for a second, he said much the same thing. "I'm the first one to confess that the spirit that I brought to Washington, that I wanted to see instituted, where we weren't constantly in a political slugfest . . . I haven't fully accomplished that," Obama told an interviewer in 2012. "My biggest disappointment is that we haven't changed the tone in Washington as much as I would have liked." From his earliest days as a presidential contender, Obama had held himself out as a healer  as a visionary who would never "pit red America against blue America," who committed himself to ending "a politics that breeds division and conflict and cynicism." That uplifting promise was at the very heart of Obama's appeal; it was what led so many voters to invest so much hope and faith  even love  in the prospect of an Obama presidency. Yet in his first term, American political life grew more bitter, not less. Unity and goodwill receded even further. As measured by Gallup, Obama supplanted George W. Bush as the most polarizing president ever. Democrats and Republicans blamed each other for the nastiness and distrust. The president often took the low road; his opponents often did too. Deeply controversial legislation, especially Obamacare, was rammed through on party-line votes. The rise of the Tea Party prefigured sweeping Republican gains in the 2010 midterm elections, which led both parties into an even more toxic relationship. By the time Obama ran for re-election in 2012, little remained of 2008's optimistic candidate of hope. In his place was a snappish incumbent grimly focused on winning a second term by any means necessary. Even liberal media outlets remarked on the disparity. "Obama and his top campaign aides have engaged far more frequently in character attacks and personal insults," Politico reported. But when voters renewed Obama's lease on the White House, they also gave him a fresh opportunity to make good on the signal promise of his rise to power. A second term offered this most polarizing of presidents a chance to extend olive branches  and to eschew the ad hominem attacks that so infuriate his critics. Democracy doesn't work "if we think the people who disagree with us are all motivated by malice," the president said in his address to Congress this month. "It doesn't work if we think that our political opponents are unpatriotic or trying to weaken America." That's exactly the right message. If only Obama had heeded it. Let's be clear: The president is not to blame for the polarization of American life. The "mushy middle" has been dwindling for years. With Democrats moving to the left and Republicans moving to the right, there is far less overlap between the parties than there was a generation ago. In a recent study, the Pew Research Center found that 92 percent of Republicans are now to the right of the median Democrat, and 94 percent of Democrats are to the left of the median Republican. What's worse  much worse  is how intensely hostile the antipathy between right and left has become. Large swaths of each camp say the opposing party is not merely misguided, but an explicit threat to the nation's well-being. Obama could have led the way in suppressing this corrosive tendency. Instead he inflamed it. It would not have required "the gifts of Lincoln or Roosevelt" to eschew the ridicule and taunts that so pollute modern political discourse. The gifts of Gerald Ford would have done nicely. Like all presidents, Obama has been frustrated by partisan opponents. But no chief executive in modern times has been so quick to impugn his critics' motives, or to resort to mockery and demonization when amicable persuasion would serve so much better. Obama routinely speaks of his critics as if their motives couldn't possibly be rational or decent. When Republicans balked at his proposal to allow 10,000 Syrian refugees to enter the United States (a proposal I favor), Obama jeered. "Apparently they're scared of widows and orphans," he said. "That doesn't sound very tough to me." Increased polarization has led to increased ideological hostility. 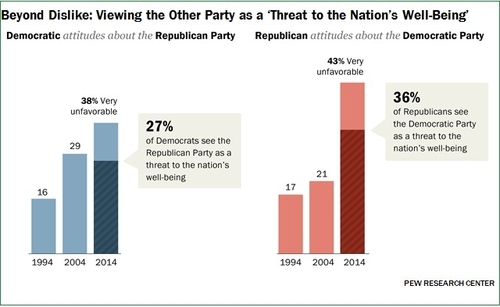 A large swath of Republicans and Democrats now say they regard the opposing camp as an explicit threat to the nation's well-being. When GOP lawmakers resisted raising the debt limit, Obama tweeted: "Are they really willing to hurt people just to score political points?" Efforts to repeal Obamacare he attributed to cruelty  the "one unifying principle" for Republicans, the president told reporters, is "making sure that 30 million people don't have health care." With Obama, there seems to be no possibility of honorable disagreement. Oppose something he wants, and you are a bought-and-paid-for stooge, or a denier of science, or a peddler of fiction, or a scoundrel who puts party ahead of country. He isn't the only one who talks this way, not by a long shot. But he is our only president, and how he expresses himself matters. When presidential rhetoric is mean and contemptuous, the whole public square is befouled. It can always get worse, as Donald Trump demonstrates daily. But an awful lot of Americans, Republicans and Democrats both, want it to get better. Obama insisted he was going to heal the divide, but never even made the effort. He still has a year in office. It's not too late to start.